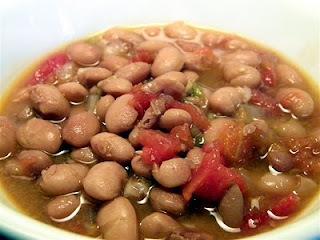 Also known as frijoles charros, charro beans, or basically, Mexican pinto bean soup. The name I've heard the most is frijoles a la charra. I like to blame it on pregnancy, but really, I get random cravings for random foods all the time. Actually, what happened this time was on Monday, D was watching an episode of Throwdown with Bobby Flay. It was a burrito challenge, and the guys he was challenging were making their own refried beans, with what looked like a mixture of pinto and black beans. 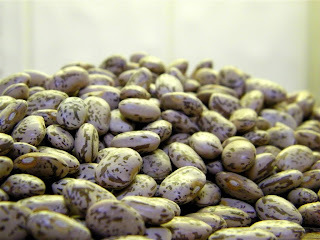 I suddenly got the notion to make frijoles a la charra. You would have made that immediate connection too, right? Anyway, I'd never actually made them before, so I started looking on the internet for recipes. I found quite a few variations, and tweaked them to come up with the one I'm posting below. These may not float your boat, but they were well received at my house on Taco Tuesday. Okay, Sean wouldn't even try a bite, but what's new? A few notes before we begin, however. I like to wear gloves whenever I'm working with jalapeno peppers. Whatever you do, just be very careful not to rub your eyes, nose, mouth, grab the kiddo's sippy cup, etc when you're working with them. Only badness can follow. I cut back a bit on the spiciness this time around. D wasn't feeling well, and my stomach can't handle too much spice (heat) right now, so I wanted to make sure we could all actually eat it!! The recipe calls for chorizo, a spicy sausage, but I left it out. If you can't find any chorizo locally you could substitute hot Italian sausage instead. The recipe also calls for bacon, which I'm listing as optional. I tasted the beans at the point where you would add the bacon, and didn't really feel like it needed it. I thought the ham hocks gave it enough of a smoky pork taste that the bacon wasn't necessary. While the recipe doesn't call for it, you could certainly remove the meat from the ham hocks and add to the beans, if it doesn't fall off the bones naturally during the cooking process. Sort and rinse the dried pinto beans. Cover with 6-8 cups fresh water (or enough to cover by one inch) and soak overnight. Drain the beans. Place in a large pot and add enough fresh water just to cover. Bring to a boil. Add the smoked ham hocks and whole garlic cloves. Reduce heat and simmer for one hour. Remove the garlic; mash or mince the garlic and return it to the beans. Add the onion, jalapeno peppers, tomatoes, tomatillo, and chicken broth and simmer for another 1-1/2 to 2 hours or until beans are tender. Stir occasionally and check to make sure there's enough water. In a skillet over medium heat, cook the bacon until almost crisp. Add the chorizo and cook until done, stirring frequently. Add the mixture to the fully cooked beans. Taste and add salt if necessary. When ready to serve, top with the freshly chopped cilantro. *You can also leave the seeds and veins in the jalapenos, and add them to the beans sliced ("nacho style"). I left them halved and removed the veins and seeds to cut back on the spiciness a bit, and so I could pick the peppers out easily before serving to the kids. You can add more jalapenos to suit your taste if desired. (Some freshly chopped jalapenos added in at the end would make for a nice kick too! ).